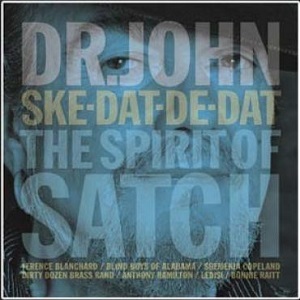 Dr John is a musical icon from New Orleans, and on this album he pays tribute to another icon from New Orleans, the legendary trumpeter and vocalist Louis “Satchmo” Armstrong. It's an album of covers of Lousi Armstrong songs, including his biggest hit, "Wonderful world". It's not the first tribute album for Dr. John, who has previously released tribute albums to musical giants Duke Ellington and Johnny Mercer. On this album, Dr John hasn't just done straight covers though, instead he's brought in a host of special guests and given some of the songs a major facelift. The album kicks off with "Wonderful world", and straight away you can hear the differences. This is much more up tempo than the original, and has a very different sound. It's a great version but the original is so good and such a memorable songt that this could never live up to the original. "Mack the knife" for example is definitely very different from the original - it's got a rap for a start. The song starts off with a strong trumpet driven section and with vocals from Dr John before moving into a rap section featuring one of the guests, before returning to the trumpet and vocals style again. "Tight like that" in contrast has a Latin sound. Bonnie Raitt duets with Dr John on "World on a string" with her soft smooth vocals contrasting nicely against his more gritty vocals. Other guests include Blind boys of Alabama, Shemikia Copeland, Anthony Hamilton and The McCrary sisters, Dirty Dozen Brass Band and top trumpeters including Nicholas Payton and Arturo Sandoval. It's a superb album - some songs feel like they've just been brought up to date and given a fresher sound, while others have been changed significantly. Whichever approach is taken on a song though, the results are excellent. It really is a great album and I'd suggest you watch the teaser video below for a sample of the various songs on the album - I'm sure that after that you'll want to buy the album.